Live map apps are commonly found on our smartphones but did you know that there are various live maps available on the web which are easily accessible by your laptop? Have you ever had a need to plan a trip in advance but worried that uncertain traffic conditions might steer your travel plans of course? Are you planning the best time to leave your house to avoid the usual crawl to get to the airport on time. Want to know if the congestion caused by a car accident has cleared up? The following live map web apps will give you all the insights you need to gain a upper hand over any monstrous traffic conditions. Probably the best option from this list. 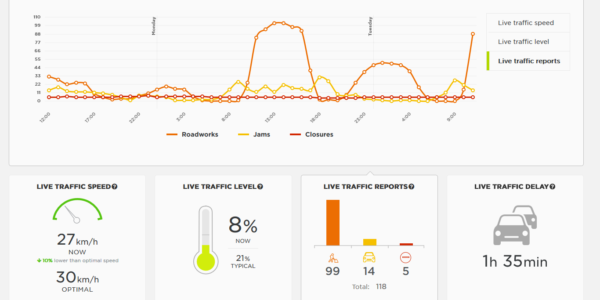 Waze uses live traffic data crowd sourced from Waze users all over world in real time. Given that users are consistently reporting events and traffic to the app, the live data displayed from the app is possibly the most accurate traffic information you can get. Aside from the various routes fitted with their journey time and distance, Waze has the perk of live reports generated from its mobile app. This ranges to the general traffic reports to specific markers such as police traps and road blocks. The web app is simple and very functional for its purpose of checking the latest traffic information or planning one sometime later. Under the search bar, there is an option of checking the condition of a route for a choosing a specific hour. Compared to other services on the list, there is currently no option to see the typical traffic of a future date. For its purpose of simply checking for traffic and directions without all the bells and whistles, Waze live maps does it well. Did you know that you could check for traffic information using google maps? Yes, you can and it’s quite reliably equipped with multiple features. In the top left menu bar, you can select traffic. 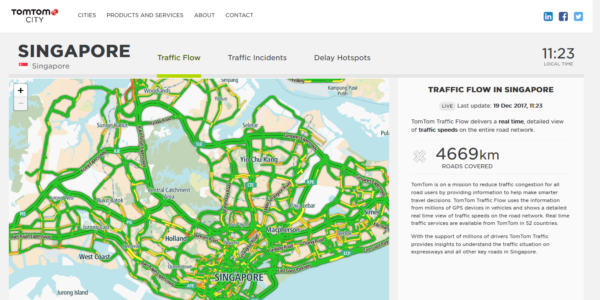 Alternatively, you could just search for an area traffic in the search bar such as “Kuala Lumpur traffic” and it will show the traffic results in the area. One handy feature that google maps have over others is the option of switching from live traffic to typical traffic at the bottom bar. It allows you to tweak the slider to check the typical traffic flow during a time or a specific day. Need to plan out your journey in advance? Google maps is one of the best place to do your research in advance and avoid the dreadful crawl. Some people use Microsoft’s bing maps as their go to option although it may not be as popular with many. Navigation in bing maps feels fast and convenient. Their material design of their user interface breathes simplicity and ease of use. Personally, I particularly like their multiple tabs feature that allows you to search multiple journeys and places at a time. This gives me more room to switch between journeys and compare them with my travel plans. This feature gives an upper hand over google maps which restricts you to search for one journey at a time. To use Bing map’s traffic feature, select the ‘more’ option next to the search bar and select traffic. A cool feature that Bing maps have is the ability to view road camera images of live traffic. This gives you an idea on what to expect when you start your journey. HERE Wego is more commonly known for their highly rated offline navigation apps in the google play store and apple app store. If you are travelling around in a foreign country with limited to no mobile data, HERE Wego is very convenient for offline navigation. In their web app, there is a handy traffic list column below the search bar that list down all the traffic congestions based on the view you see in your screen. With their main navigation feature, you will be able to get directions around selected areas with various forms of transportations from public transportation to bike journeys. Some cities, even include taxi and car sharing navigations. Although the traffic information can be said to be fairly accurate, it suffers from its limitations. HERE wego is the limited traffic data, narrowing its functionality to mainly major cities in the world. Other than that, navigation with here wego’s mobile app is seamless and intuitive for any users. Tomtom is notably known for their reliable GPS navigation products used in cars worldwide. Although their navigation services and mobile apps required a fee or a subscription for the latest updated maps you might be interested in paying for the value it brings. They have a free webapp that provides insightful and data rich reports for those who love their numbers. Their data is sourced from millions of GPS devices worldwide and real time traffic is displayed in their website. Detail data such as traffic congestion index to delay hotspots are marked in the map, giving you the relevant data you need to plan your journey. From traditional maps to satnavs, directions and navigation have always been a key feature in these products. These days we have navigation apps that have revolutionized the way we drive incorporating traffic information and road events. Who knows what holds for the future of navigation? Driverless cars will probably be next. However, until that time comes, we should be grateful that we are able to access real time traffic information in the comfort of our home and knowing that we have a little more control over our journeys.